« Attention foodies – top 25 list includes all inclusive resort favorites! • Food and drink – All I can say is wow! I enjoyed some of the best meals I’ve had at any all-inclusive resort. Don’t miss the incredible crab crusted salmon at Le Jardinière; scrumptious shrimp, spinach and puff pastry appetizer or fiery jerk pork with fresh pineapple at Spices; delectable sushi at Soy; crepes with fresh fruit and specialty coffees at Café de Paris; Mediterranean inspired salad and local seafood at Neptunes; or a great steak at Butch’s Chophouse. Every dish I tried at Sandals La Source was excellent and a distinct step up from Sandals’ prior best. The same could be said of drinks and I had a mean martini, nutmeg infused rum punch, well-made black russian and several varieties of wine. All good and of course all included! • Rooms – There isn’t a bad room in the house although I have clear favorites at every price point. Entry level rooms at Sandals La Source are lovely with comfy king beds, high end bath fixtures and huge walk in rain showers and you can choose a beachfront room quiet enough to be lulled to sleep by waves lapping at the shore or step up the energy and stay near the South Seas pool. Butler suites with private pools are stunning and come in an array of locations from ground level rondovals tucked amidst tropical gardens to the tippy top floor of the Italian Village with stunning ocean views. Waterfall and swim out river suites offer even more unique accommodation choices. Check out the kazillion room choices or ask for help choosing one of the best rooms at Sandals La Source in your price range! • Beach – With the resort at 100% occupancy I found the beach half empty so there is ample space to spread out and find the perfect chaise lounge in the sun or shade. The sand is soft and white and the water clear and inviting with no seaweed or rocks to interfere with a delightful swim in the ocean. Drink service is available on the beach and there are no vendors hassling guests. • Pools – There are too many to count! The South Seas signature pool is the largest with a huge swim up pool bar and cabanas dotting the perimeter. The Pink Gin section has a beautiful beachfront pool with sitting area and fire pits integrated into the design for day or nighttime enjoyment. Dozens of butler suites have their own private pool and Jacuzzi and swim up suites have direct access to a beautiful river pool which flows along the ground floor of the Italian Village. • Watersports – Scuba divers and snorkelers will enjoy a vibrantly alive reef system teeming with brightly colored fish and coral. All dive equipment is free of charge and dive sites on Grenada include an underwater sculpture park, marine reserve and various walls and reefs. Seasoned sailors will find enough breeze on a typical day to challenge their skills and those new to the sport may request a ride with a watersports captain at the helm. Kayaks and trikes are in good supply but were unused during my stay. • Fitness – There is a brand new fitness center with state of the art equipment, a personal trainer and daily classes including core training, abs blast, yoga, circuit training and aquasize. • Weddings – Although many will choose a beach wedding with toes in the sand, my favorite spot at Sandals La Source Grenada was a secluded garden bridge amidst tropical foliage and flowers. But whatever setting is chosen Sandals Beautiful Beginnings Wedding package is free and getting married in Grenada is easy. So where is Grenada and what would you see and do on the island? Grenada is known as the spice island and you’ll find cocoa, cinnamon, nutmeg, turmeric, mace, vanilla and other spices growing is casual profusion. If you decide to tour the island stop and see John at the Spice Place for a demonstration of how spices are harvested and processed plus a nice selection of product for purchase. Belmont Estates is another great place to stop where you can learn about cocoa processing and taste the yummy product. The coastline of Grenada is dotted with 55 beaches including one pink, 9 black sand and 45 white sand beaches. Leatherback turtles lay their eggs April through June on the north end of the island and a few months later baby turtles make their dash to the sea. Grenada’s interior is rainforest and there is dense vegetation, monkeys and numerous waterfalls to enjoy. It takes some hiking to reach 7 Sisters and Mt Carmel but other waterfalls are only steps from the road and easily accessible to all. Other sites include a historic fort, two rum factories and Leaper’s Hill where fleeing Carib’s leapt to their death to escape imprisonment by invadors. 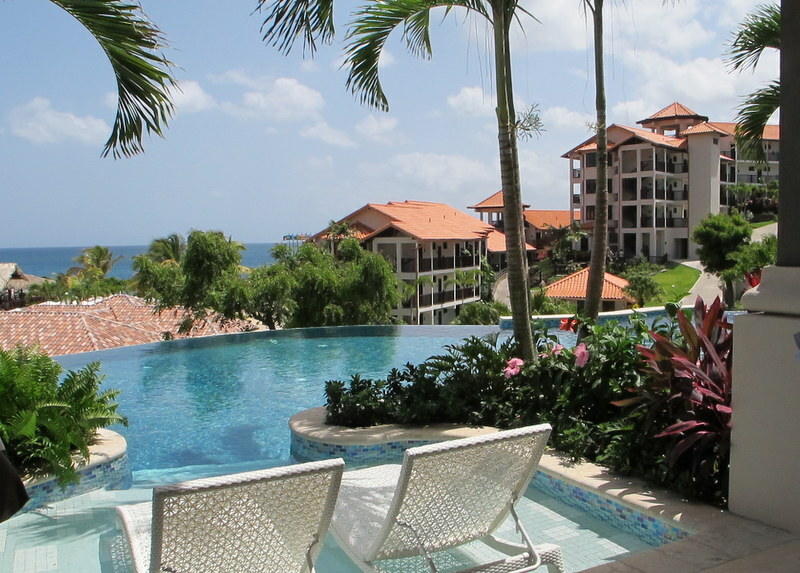 Grenada is at the southern end of the Caribbean chain and escapes most tropical storms and hurricanes. In fact it was 50 years between major storms until Ivan and Emily packed their one two punch in 2004-5 so hopefully another 50 years will go by before the next storm to worry about! So put Grenada and Sandals La Source on your must do list and call or email linda@totemtravel.com for favorite room categories, help figuring out the somewhat challenging air situation and more info to make your vacation or honeymoon perfect. Still not sure how to choose the best all inclusive resort? Call us! We’ve been to all the resorts and will make it easy and fun to plan the perfect honeymoon, destination wedding or all inclusive vacation. Plus we guaranteed the lowest prices, can help with tours and special requests and will make sure you don’t miss any of the amazing specials and deals. That’s what we’re here for!